This match was book-ended by two respectful handshakes; one before the match, and one after. In between the shows of respect from the two fan favourites, was a hard-hitting match, which both men hobbled out of gingerly. Thrill Seeker showed his experience edge for a while, but he was caught out by Sonny Wildside's pure quickness! In the end, Wildside hit his 'Fear Factor' from the top rope. A move that no one kicks out of! After a short commercial break, the man mentioned at the top of the show: Edd Stone made his way to the ring... He stood in the middle of the ring, and confirmed that he was accepting the challenge of Aaron Andrews for Summer Smash... BUT... He still wants to fight Ricky Dale Johnson... So he slid out of the ring, and sat on a chair next to Peter Michaels and Tom Townsend... Edd began messing with the two veteran announcers... pulling Michaels' tie, and drinking from Townsend's bottle of water... before pouring it out all over the announce desk... The bullying didn't last long... Because Aaron Andrews came flying out from the back!! Andrews ran down the ramp, and ran around the ring to attack Edd Stone... 'The Animal' ran around the other side of the ring, and thought he'd gotten away... He pointed at his temple, claiming to have outsmarted Andrews... But he turned his back on Andrews, and 'The Ace' had made up a lot of ground on him... Before he knew it, Stone was getting clocked on the back of the head by his rival!! But it didn't take long for Stone to gain the advantage in the fight by using his patented low blow!! Andrews dropped to the floor, and Stone began beating him up... Referees and officials came running out to Aaron Andrews' aid... But they couldn't stop Edd Stone before he kicked 'The Ace' on the back of his head!!! Danny Cavanagh's words hung in the air a little as we headed back to ringside... Peter Michaels and Tom Townsend spoke about Cavanagh's desperation to be the man to defeat Gargantuan... They also spoke about who else might be a contender for 'The Monster'... 'Mainstream' James Hernandez DREW with the undefeated 'Monster' last week... and the entire active DeColt family will also want to get their hands on the Champion again... But the challenge has been made by Cavanagh... Will Gargantuan accept...?! Or will Alex DeColt make the match...?! Mark Griffin and Lord James King are evenly matched in many ways, but King's experience edge was perhaps the difference in this one. He was able to distract the referee a couple of times, and use under-handed tactics to gain an unfair advantage. For the finish, he ripped a turnbuckle cover off, and the referee had to try to fix it. He then popped his patented brass knuckles out of his trunks, and smacked Griffin in the face with his 'Power of the Punch'!! The Montero Brothers are an absolute joy to behold when they're in this form. Their cohesiveness is almost impossible to deal with, no matter how experienced their opponents are. Donte Dunn and Erik Strong are both talented in-ring performers, but neither of them could handle the quickness of Gino Montero either! For the finish though, the more experienced brother Luis Montero Jr. hit his 'Flying Forearm' finisher on Dunn to score the win! Wade Orson has the biggest match of his short NOTBPW career this Saturday, as he'll go 1 on 1 with the man known as POISON. Tonight he had to survive a match against Hugh Ancrie, and 'Mr. Impact' wasn't about to let the young Brit walk out with an easy victory. Ancrie probably had around 70% of the offence, but in the end it was a vicious lariat from Ancrie that caused Orson to end up on his back. It was from that position that Orson hit his 'Bounce Back' (Kip Up DDT)! The man that attacked Wade Orson a few weeks ago: POISON appeared on the stage next, peering out from a hidden position... The camera picked him out, but Orson didn't know he was there... 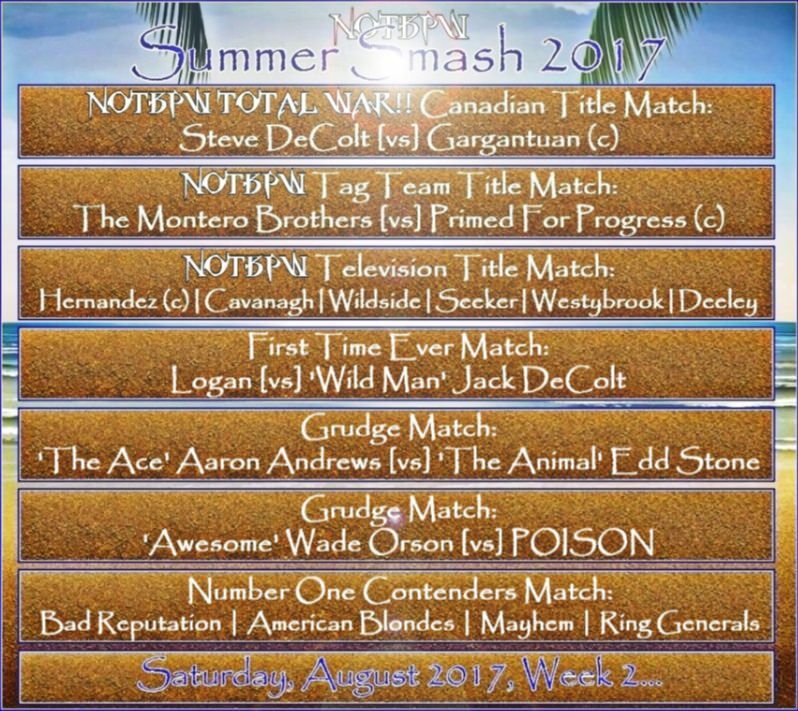 The announce team confirmed to us that at Summer Smash this Saturday, Orson and POISON WILL go 1 on 1 for the first ever time!! POISON is undefeated since signing for NOTBPW, over one year ago, but he missed almost 13 months through injury... Wade Orson has only lost once since arriving in Canada... a tag team match on his second night with the company... Something's got to give this weekend!! 'Mainstream' James Hernandez came very, very, close to defeating 'The Monster' Gargantuan last week... 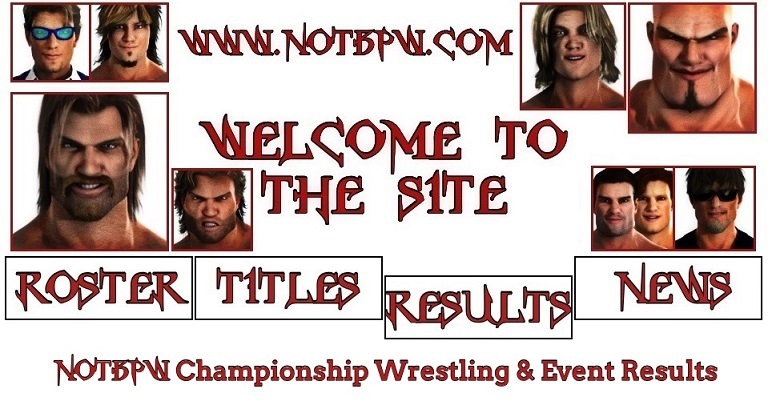 The NOTBPW Television Champion knew he was in dangerous territory in the ring with the huge NOTBPW Canadian Champion... 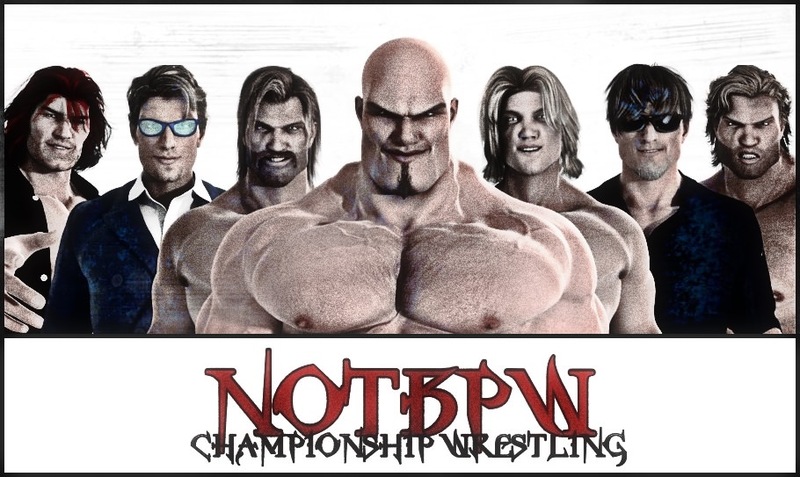 But he more than held his own, and by the end of the match, would have been disappointed not to have picked up the win... Had the 'ten count' been allowed to be an 'eleven count', Hernandez would have been the first man in NOTBPW to defeat Gargantuan!! That's how close he was to climbing back into the ring and beating the count... Is he the next in line for a Championship Match...?! Will he be the man to fight the winner of Steve DeColt and Gargantuan at Summer Smash, in Total War...?! Sean Deeley attempted to kill all the momentum Angry Gilmore built up in his historic debut last week, by overwhelming the former SWF World Champion! Deeley thought he could outwrestle Gilmore, but the big, strong, fighter refused to allow it. At one point, Gilmore threw Deeley over the top rope, and he landed on all of his 'Shooter' friends!! Gilmore followed him out, and delivered big boots to all three of them. He rolled Deeley back in, and 'The Shooter' was able to lock the newcomer in his 'Front Choke Lock'. Gilmore was close to the ropes though, and forced the break! He then countered a German Suplex attempt, and rolled Deeley into the 'Anger Management' Arm Bar!! Deeley tapped almost straight away!! Aaron Andrews, Edd Stone, Ernest Youngman, POISON, Sean Deeley, Sonny Wildside, Thrill Seeker and Wade Orson... A number of rivalries will collide in the tournament, but one point to make is that IF either Sean Deeley, Sonny Wildside or Thrill Seeker capture the Championship on Saturday at Summer Smash, then the former Champion James Hernandez will replace them in the tournament!! There are a couple of experienced guys in the field of eight, and a couple of young dark horses... But a lot depends on what goes down this weekend... The darkest of dark horses might just be Ernest Youngman... He doesn't have a match this weekend, so he'll be going in to next week 100% fresh!! The Natural and Jack DeColt are two names synonymous with Canadian Wrestling in the last 20+ years. They haven't fought many times though, and this match showed how skilled they both are, but how unfamiliar they are with one another! Jack DeColt also seemed a little conflicted. His thoughts looked elsewhere, and the announce team speculated that he was confused by his upcoming pay-per-view match with the man known as 'Logan'. For the finish to this one, after The Natural had scored a number of 2 counts, he walked onto an 'End Of Days' from the 'Wild Man'!! There was no kicking out at 2 of that one!! Just thought I'd share this to show you how well the other big companies are doing... TCW have slipped dramatically, and we're hot on their heels for that 5th spot... 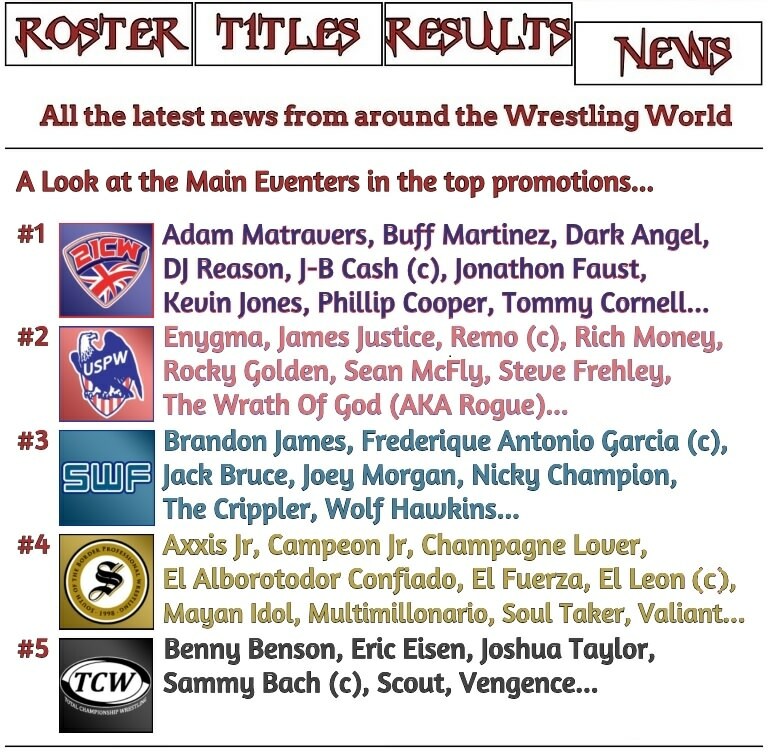 The signings of Eric Eisen, Vengence, Johnny Bloodstone and Primus Allen have done little to stem the flow of losing huge names like Wolf Hawkins, Rocky Golden, Bryan Vessey, Jay Chord, Danny Fonzarelli, and of course, Aaron Andrews and Edd Stone!! However, 20 year old Harvey Robbinfield looks to be a star in the making... He's now the current TCW International Champion! !